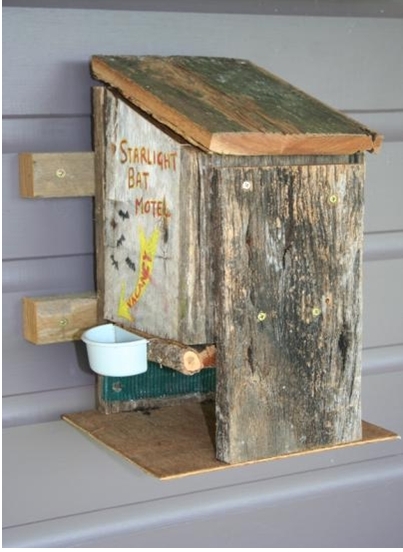 We also constructed a couple of bat boxes using a variation on a design downloaded from www.bats.org.au. The plan was modified so that it could be free standing in the bat tent during the rehab period and then wall mounted at the time of release. I also used metal hinges rather than the suggested strip of rubber as it made a much more weather proof and stable lid. 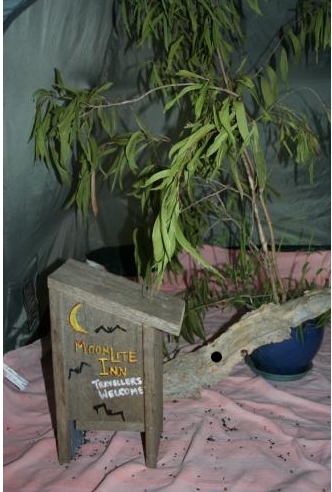 The box in the photo was the second one I made and is very easy to construct and seems to be very popular with the bats. The photo shows the box setup on the inside of the bat tent. 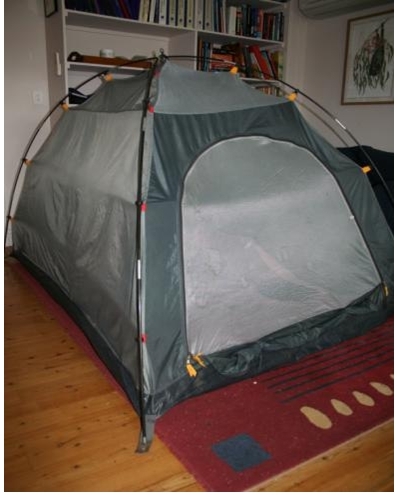 When the bats are ready to start flying around, we opened the front flap of the tent to allow them to fly around the room. Each morning they were happily back in the box after a night of mischief. 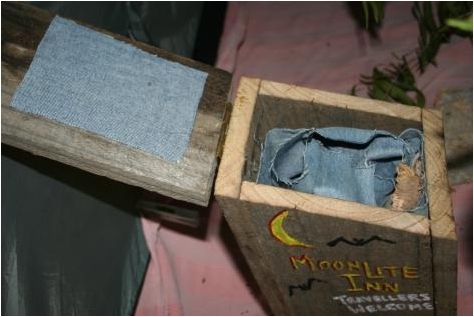 The inside of the bat box has some denim salvaged from an old pair of jeans, hot-glued to the lid and the sides. A short length of jeans leg is stood inside the box to provide places for the bats to roost. They don't seem to like the boxes as much when there is a big open space in the middle. For rehab purposes though we need to be able to get a hand in to retrieve the bats for feeding, weighing, cleaning and so on, so this size of box is ideal. The star of the season is definitely Zephyr, a Little broad-nosed bat, who Gabi raised from a 3g, furless baby through to 9g at which stage she was released after 57 days in care. She now lives in a bat box on our front veranda and comes in each day for a couple of meal worms to help her on her way. Shortly after release she disappeared for 10 days but since then has been present every day. Released together with Zephyr were 3 Eastern freetail bats, Beeza after 22 days in care, MV Agusta after 16 days in care and Woody after 5 days. The freetails all departed the bat box fairly quickly but were all in good health and had been kept together as a group prior to release. Shortly after this we released Bunning and Mistral, two more Little broad-nosed bats. They were put into the bat box with Zephyr. Bunning stayed around for a couple of days and then was away for a week and now returns every 3 or 4 days. Mistral left the first night and has not returned. Great excitement yesterday as, on checking the bat box in the middle of the day, there was a stranger in the box with Zephyr. It looks like word is getting around! We now have another Little broad-nosed bat who had big holes in the wings after a cat attack. He has been with us for 23 days and all but the largest hole has now healed. I guess about another 4 weeks before the holes are healed and then some time gaining flight strength prior to release. Our mealworm colony has definitely been a success with the bats this year. Supercharged with calcium and vitamins along with bran, a little lucerne chaff and some carrot and zucchini. 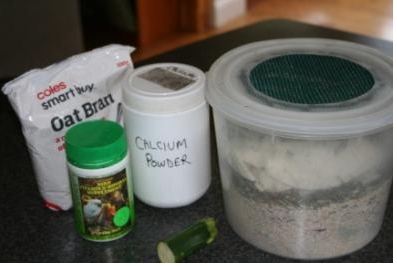 A second box with the same food mix holds the beetles that emerge after the worms pupate. A couple of pieces of paperbark form a good surface for the beetles to lay their eggs. This ensures that we have an on-going supply of worms without having to pay the exorbitant prices at the pet food shops. For those of you who need recipes for microbat food, they are now available in WildMan. When you add a diet History record for a microbat, the drop down list of formulas has a number of different recipes. When you select one, the recipe is shown in the "instructions" box below the drop down list. We fed the baby microbats Wombaroo Flying Fox milk. 20 ml milk and added ¾ ml megadern. Once they grew older we supplemented with Bat Soup and Bat Custard, as per the recipe on Wildman. Feed regimes started at four-five feeds per day and reduced to one prior to soft release. 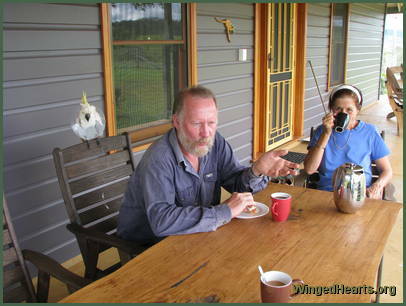 Peter Richards and Gabrielle Friebe run the Long Grass Wildlife Refuge Centre and have been caring for wildlife for over 35 years.